Pogs is a game that was popular among children during the mid 1990s. The name originates from POG, a brand of juice made from passionfruit, orange, and guava; the use of POG bottle caps to play the game preceded the game's commercialization. The game of pogs possibly originated in Hawaii (Maui) in the 1920s or 1930s, or possibly with origins in Menko, a Japanese card game very similar to pogs, which has been in existence since the 17th century. Pogs returned to popularity when the World POG Federation and the Canada Games Company reintroduced them to the public in the 1990s. The pog fad soared, and peaked in the mid-1990s. Pog typically relies on two types of playing discs: pogs and slammers. Pogs are typically flat circular cardboard discs which are decorated with images on one or both sides. Traditional (or traditional-style) pogs are made of rougher cardboard, are printed with limited colors, and often have a staple in them (as they appeared when used as actual POG bottlecaps), while modern commercial pogs were stiffer, thicker and are often printed with colorful glossy imagery. The other equipment that is used is a slammer: a heavier game piece often made of metal, rubber, or more commonly plastic which come in various thicknesses and weights, but are typically similar in diameter to pogs. Metal slammers are not allowed in some games because they are typically heavier than other materials, giving the player with the first turn an unfair advantage. The players take turns throwing their slammer down onto the top of the stack, causing it to spring up and the pogs to scatter. Each player keeps any pogs that land face-up after they've thrown. The game of pogs was played on the Hawaiian island of Maui as early as 1927. The 1990s revival is credited to Blossom Galbiso, a teacher and guidance counselor who taught at Waialua Elementary School in Oahu. In 1991, Galbiso introduced the game she had played as a little girl to a new generation of students, soon incorporating pogs into her fifth grade curriculum as a way of teaching math and as a nonviolent alternative to other popular schoolyard games, such as dodgeball. The game quickly spread from Oahu's North Shore, and by early 1992, STANPAC Inc., the small Canadian packaging company that had been manufacturing the milk caps distributed by Haleakala Dairy on Maui (the same caps that were collected by Galbiso for her class), was printing millions of pogs every week for shipment to the Hawaiian island chain. The game soon spread to the mainland, first surfacing in California, Texas, Oregon, and Washington before spreading to the rest of the country. By 1993, the previously obscure game of pogs, which had almost been forgotten, was now played throughout the world. Real pog milk caps had small staples in them which, when stacked, produced a random element to the game. Regular pog milk caps were used to throw at the stack and were able to flip the pile. As the game gained in popularity, thousands of types of pogs were manufactured, covering a wide array of images of toys, cartoons, movies, games, sports, famous people and famous world leaders such as UK Prime Minister Tony Blair and US President Bill Clinton. Public awareness messages concerning topics such as first aid, safety, wildfire prevention, and drug use were also featured on pogs, and they were also used for fund raising for charities and organizations such as the Red Cross and cancer research organizations. The popularity of the game spawned pog prizes at major fast-food chains (see below), as well as knockoffs, such as "Slammer Whammers", a similar game released under a different brand name. Pogs can sometimes still be found on eBay and in game and card stores. Also capitalizing on the success of pogs were corporations and governments. Fast food chains such as McDonald's, Burger King, Taco Bell, Del Taco, Carl's Jr./Hardee's and Checkers/Rallys gave away free pogs with the purchase of a menu item. Fox television released a line of pogs with the debut of "The Tick" animated series. Disneyland produced limited edition caps for its "Go POG Wild and rollerblade Crazy" event in the spring of 1994. Knott's Berry Farm produced a limited edition set for the 1994 Southern California POG Championship. Nintendo Power released many sets of pogs featuring Nintendo characters from games like Mega Man and EarthBound that were either packaged in with issues of the magazine or redeemable through their mail-in rewards program. Kool-Aid also produced limited edition caps and slammers with the Kool-Aid Man imprinted on them, which were only available by mailing in a certain amount of Kool-Aid points. In an effort to curb drug use and crime, the Drug Abuse Resistance Education program in California designed caps with the DARE logo and Scruff McGruff, as well as county sheriff badges. Because many children would keep the pogs they won in games from other players, many school districts considered pogs a form of gambling. 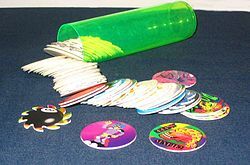 Pogs proved to be major distractions from classes and the source of various playground arguments. These elements eventually led to the banning of pogs from various schools across North America. Other bannings occurred across Australia. The World POG Federation, or WPF for short, was probably the biggest brand of pogs in the UK. Most POGs feature the POG mascot, called Pogman. These pogs had many series featuring images mostly comical in nature, or parodying skits of famous scenes from movies, or other popular culture. There were World Pog Federation pogs in Canada, the US and Australia too, but were produced by other companies, such as the Canada Games Company, or Crown & Andrews. Several waves of Playmates' Star Trek action figures came with bonus collectible, numbered, "Space Caps", featuring artwork of the figures themselves. Tazos were also popular in the UK and Australia - these were effectively pogs with notches along their circumference which meant they could be connected together and used to construct rudimentary 3D shapes. They were given away free in packets of Walkers Crisps and usually featured licensed properties - notably scenes from Star Wars, Looney Tunes and Pokémon. The Army and Air Force Exchange Service, the United States Department of Defense's largest and oldest exchange system, distributes pog-like coinage as change at its stores in contingency areas (those supporting Operations Enduring Freedom and Iraqi Freedom). The reason for adopting pogs as currency was that supply flights overseas had limited capacity and air-freight shipping involved high costs. Metal coinage weighs significantly more than paper pogs, which are also much thinner than standard pogs. While they are only issued in contingency areas, they are redeemable at any AAFES store worldwide.